Ms. Beth E. Cole was the Director of the Office of Civilian-Military Cooperation at the U.S. Agency for International Development, and is now an adjunct professor at George Washington University. A recurring feature of the past few decades is the presence of the nation’s three principal national security institutions (the 3Ds)—Department of State (DOS), U.S. Agency for International Development (USAID), and Department of Defense (DOD)—operating in complex environments abroad marked by conflict, crisis, and state fragility.2 This paradigm, dubbed the “new normal” by many, begs a few questions. What are we learning from these critical missions undertaken in pursuit of national security? Are we adjusting our strategies to maximize the prospects for prevention of conflict based on that learning? Is innovation occurring that enables us to work better together to address challenges in these environments? This article examines recent efforts in Jordan, a key ally in the Middle East surrounded by conflict and instability. Of keen interest is what the 3D did to address the unique challenges in Jordan, and how. Understanding both the “what” and the “how” might reveal if we are learning and innovating. A senior U.S. Embassy official once portrayed Jordan as the “crossroads of Armageddon.” The apt description needs little explanation beyond a look at the map. Jordan is bordered by Syria, Iraq, the West Bank, Israel, and Saudi Arabia, all experiencing conflict or directly involved in those in the neighborhood. As a result of its location at this “crossroads,” the tiny desert kingdom has absorbed millions of Iraqi, Palestinian, and Syrian refugees during the past decade, adding to a population of eight million people, already faced with severe water and energy shortages. Its geographic location also produced an array of constantly evolving security threats to Jordan’s territory and concomitant demands for appropriate response. With the advent of the “Arab Spring” in 2011, mass demonstrations spread from northern Africa to the Middle East, igniting an arc of instability that toppled governments in Tunisia and Egypt and resulted in civil wars in Syria, Libya, and Yemen. In Syria, a brutal crackdown by President al-Assad’s forces on opposition groups led to a conflagration involving hundreds of groups with shifting alliances and the introduction of foreign fighters (including from Jordan). The groups included reorganized al-Qaeda remnants from Iraq operating under the new banner of Islamic State of Iraq and the Levant (ISIL) that were intent on creating a “caliphate” traversing both states. Its sometime equal, the al-Qaeda-affiliated al-Nusrah front, later called Jabbat Fateh al-Sham, also fought against Assad, and both created unholy alignments with opposition forces that needed more firepower against the unyielding regime. Buoyed by assistance from a plethora of states—notably the United States, Middle Eastern, and European allies—the opposition limped on while the main focus for the West was the defeat of ISIL. Meanwhile, Iran and then Russia joined the conflagration with troops and material to keep Assad in power. As years passed and conflict in Syria spiraled, Iraq also succumbed to the peril of ISIL as major cities fell to the deadly terrorist group. The Syrian war and renewed conflict in Iraq proved to be extremely costly for Jordan’s security, amplifying both fear of its spread into the Hashemite Kingdom, and the potential for violent extremism to take root in Jordan. Signs of the spread of violent extremist organizations (VEOs) intensified in Jordan, with several attacks in 2015 and 2016. Civilian casualties occurred in December 2016 when ISIL was disrupted from executing an attack, and, in the process of escaping, fired on people at a tourist destination. ISIL actors are not alone in Jordan; roughly one third of Jordan’s 15,000 Salafis are estimated to be jihadis.3 They have been getting target practice in Syria, to where an estimated 2,000 reportedly have traveled, with some even assuming leadership positions with al-Qaeda-affiliates.4 Fear grips Jordan that these battle-tested foreign fighters have returned or will return to use their new skills and recruit from unemployed and disaffected youth to mount attacks within. Jordan has cause to worry about disaffected youth and other disgruntled citizens. For a long period, Jordan provided for its citizens through large public programs that created unsustainable debt. Pressed by donors, Jordan has dialed back its public spending in recent decades and attempted to liberalize its economy. The resulting growth and decreased debt relative to the Gross Domestic Product has come at a cost.5 While some urban dwellers benefited from this policy shift, the Kingdom’s strongest supporters who reside in rural southern and eastern areas—have not, thereby increasing discontent and fraying the traditionally warm relationship with King Abdullah II and his government. The concentration of power in the hands of King Abdullah’s regime is yet another source of tension between the government and the population. With widely perceived corruption and lack of accountability, civil society organizations have pressured the government to devolve power. As the Arab Spring tore across the region, protests throughout Jordan finally forced a change of government, constitutional reforms, and later, more political parties able to field candidates. The lack of water is noticeable to the naked eye as one traverses the arid landscape. Compounding the scarcity of water, Jordan, unlike its oil rich neighbors, lacks any domestic fossil fuel. The twin curses were exacerbated as conflict in the region disrupted energy supplies, and the influx of refugees increased demand for these precious resources. The added thirst for water and energy fueled discontent among Jordan’s existing population and even catalyzed conflict as people competed for their share. Jordan’s per capita water resources are among the lowest in the world.7 Water is taken from aquifers that are overdrawn and often polluted; and from the Jordan and Yarmouk rivers which also supply Israel and Syria. To serve the huge refugee population, Jordan had to increase investment in water infrastructure to deliver it to people that are settled far from the primary sources. Jordan hosts an enormous refugee population for a country its size. 500,000 Iraqis settled in the Kingdom as of 2016, joined by a conservative estimate of 649,000 Syrian refugees.10 Added to this mix are two million Jordanians who are either Palestinian refugees or of Palestinian descent, and another million migrant workers. The United States had to address a multitude of complex problems in order to help keep its key ally from succumbing to the fate of others in the region wracked by conflict and violent extremism. After the closure of the U.S. Embassy in Damascus in 2012, the United States had to rapidly scale-up assistance to those trapped in Syria’s conflict from neighboring countries; help those bordering Syria deal with the influx of refugees; and block the flow of arms and fighters into Syria. All proved to be daunting tasks. Throughout that year, responsibility for these efforts increasingly shifted to the U.S. Embassy in Amman. In February 2013 what was supposed to be a relatively normal embassy was in reality operating at a frenetic pace. A thin, overworked staff was shouldering new additional burdens to help contain the crisis next door and serve as a focal point for humanitarian and other assistance to Syria’s trapped citizens. Fear was palpable as the once family-friendly post took on an edge of guarded vigilance; the risk of failure meant conflict spilling over to one of the United States’ most important allies in the world. The trickle of Syrian refugees in 2011 became a flood as 236,487 and nearly 300,000 arrived in 2012 and 2013 respectively.14 In the early days of the conflict Embassy staff were able to cross the border into Syria. But that same border soon devolved into a fortified, defensive one as fear of spreading conflict became a paramount concern. This dramatic influx of U.S. personnel in Jordan arrived in response to an array of complex challenges, which included a river of refugees into Jordan itself, and a host of conflict-affected Syrians inside Syria’s borders. Hospital emergency rooms and poorly equipped clinics were overrun as Syrian refugees sought health care. A large number of these refugees, some with heart conditions and other ailments easily treatable in normal times, had been denied access to medical care in Syria. Health conditions had declined. People were desperate. Many were victims of trauma, having witnessed unspeakable atrocities, and required psychological services not available in the desert kingdom. Schools groaned under the weight of new students. Water lines were illegally tapped, damaging water systems and blocking access. Garbage piled up more rapidly than it could be carted away and the question of where all the garbage would go was a vexing one. The velocity of emerging problems strained communities, threatening to unleash a spiral of conflict within Jordan’s northern municipalities. As the human stampede continued across the border, fear of VEOs infiltrating Jordan rose to the short list of priorities. The 3Ds moved quickly to respond to events across the border, working together to deliver cross-border assistance from Jordan to conflict-affected Syrians. This required balancing between tight security of Jordan’s border, while allowing refugees to cross into the Kingdom, and assistance to cross into Syria. Because the challenges of cross-border assistance and border security were so massive and complex, the U.S. Ambassadors to Turkey and Jordan decided to divide Syria into northern and southern areas of responsibility. The 3Ds also collaborated to ramp-up assistance to the Government of Jordan (GOJ) and host communities for development, security challenges, and resource shortages exacerbated by the refugee influx. They had to confront threats of homegrown violent extremism as well as those from ISIL infiltration. This required humanitarian assistance, increased health, sanitation, water, power and education services, conflict management, work to counter violent extremism, and security support. With fresh memories of Iraq and Afghanistan where host nation governments railed against alleged U.S. “occupation,” the United States decided to work hand-in-hand with the GOJ on the response. To an extraordinary degree, all proposed assistance to both Jordan and to Syrians was discussed with the Jordanians. The United States also agreed to vet all implementers and beneficiaries of assistance in Syria prior to delivery. The 3Ds often went together to meet with GOJ representatives so that proposed assistance and ongoing programs could be thoroughly briefed. This reduced the common stove-piped responses based on mutual ignorance that could potentially undermine goals and objectives. An example of this novel approach, discussed below, is the briefing on VEO activity in Jordan arising from a joint study undertaken by the 3Ds. To accomplish this behemoth task, the 3Ds organized themselves to ensure unity of effort, including sharing of information uniquely possessed by each of the agencies, special structures to facilitate coordination, and embedding staff in each other’s organizations to enhance alignment. This benefitted the assistance to Jordan’s beleaguered population and Syrian refugees as well. 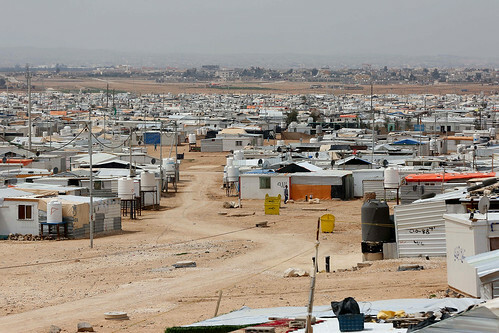 Three refugee camps had to be built in Jordan, with U.S. support, to accommodate the flood of refugees from 2012–16. 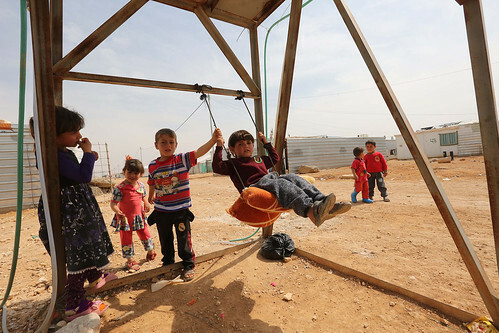 Zaatari, the largest camp, topped out at 120,000 people, and became Jordan’s fourth largest city.19 Within a five-year span, at least a half million refugees passed through its barbed-wire walls, traversing pitted, hastily erected roads in buses and other means supported by the 3Ds. The State Department Bureau of Population, Refugees, and Migration (PRM) provided funds to the Office of the UN High Commissioner for Refugees, while DOD assisted in construction of the camp and USAID provided funding to the World Food Programme (WFP). The latter was established as a cash-based transfer system that gave refugees vouchers to purchase goods at stores in the camps; an innovation developed in border countries during the Syrian crisis. This system was copied for refugees in communities outside of the camps. It offers refugees the ability to purchase food of their choice and aids the local economies in a manner more dignified than waiting in lines to receive handouts. The long-term status of refugee camps and the impact on the refugees and host nation gave impetus to encourage Syrians to move to host communities in Jordan. Many had friends and families in Jordan to aid in this deliberate policy choice. Though the accelerated pace of refugee flows made the construction and administration of camps a reality for Jordan, the majority of the refugees did settle outside of the barbed-wired encampments. The United States supported refugees in both situations. Development programs run by USAID for Jordan’s communities struggled with the added refugee population. Flexibility is not a hallmark of programs that are planned and budgeted for years in advance. Luckily, USAID had already been working to renovate hospitals in some of the hardest hit communities and began to help Jordan’s Ministry of Health develop means to assist the refugees. U.S. activities included opening hospitals and clinics, stocking them with essentials—items such as defibrillators that were rare for these communities—and providing psychological support to victims of trauma. In the beginning, a sole American health officer and three Jordanian staff ran these efforts; they were augmented later as more personnel arrived at the USAID mission. Schools were deeply impacted and the USG moved to address that problem. It built additional schools in the north and advised existing school leaders on how to serve more children. Schools started to hold three shifts in an extended school day to accommodate all the students. To alleviate tension within refugee-affected communities, USAID began a community engagement program that offered both existing and new residents the opportunity to create solutions to problems they were facing. To deal with the mountains of newly generated trash, USAID imported trash trucks and trained people to operate them. As water became an issue of contention and pipes were hacked, USAID assisted in the delivery of more water from alternative aquifers to meet demand. The United States also provided funding for a desalination plant to augment scare water resources throughout the country. As Syria’s crisis evolved into one of most complex conflicts in recent history, and cognizant of protracted stays by refugees in other host countries, the United States had to evolve its strategy. The development approach shifted in an innovation that was being tested globally to promote “resilience” within communities that suffer from repeated shocks. Beginning in 2015, rather than separating humanitarian from development efforts, one directed at the refugee population and the other at the native Jordanian population, the United States layered both in the same location.20 The aim was to directly help communities benefit developmentally from the added refugee population and to help refugees become productive members of the communities. In this landmark shift, the United States moved from development programs that were created to serve only Jordanians to ones that counted the refugees as beneficiaries as well, impacting the planning and monitoring processes that now took into account the added population. Humanitarian assistance, for example, provided by DOS/PRM, was used to pilot a vocational training project for refugees that could potentially lead to wholesale efforts to serve entire border communities in Jordan. The introduction of Russian military support to Syria’s President al-Assad in September 2015 increased the complexity for the United States and its allies. Violent extremist activity in Jordan accelerated in 2015 and continued into 2016. In December 2015, CF–J morphed into the Combined Joint Operations Center-Jordan to help Jordan and coordinate equipment and other support to OIR. During the period 2011–16 Jordan became a highly dynamic and challenging humanitarian and security environment. Violent extremism had become more than a passing concern. Indeed, with increasing appreciation of what had become a more tangible threat, in 2015 the Royal Hashemite Court of Jordan (the Royal Court) permitted U.S. Embassy Amman to conduct an assessment of violent extremism in the Kingdom. To accomplish this task, the USG employed an innovative approach toward coordination that leveraged resources from across DOD and expertise from USAID. The Jordan case arguably represents a scenario where the USG effectively applied its hard-learned lessons across the 3Ds. Capable and experienced leadership in each organization was key; individuals brought previous experiences working across the 3D agencies that enabled them to better appreciate the mix of capabilities and needs, understand that special crisis structures were needed in addition to regular embassy systems, and recognize that embedding personnel from one agency within another greatly improved coordination and collaboration. These insights also enhanced the ability to balance immediate humanitarian imperatives with long-term developmental and security priorities. Whether a deliberate innovation or not, the 3D organizations recognized the complexity of integrated USG operations and assigned leaders who possessed invaluable prior experience in working across the USG interagency community. In 2011 DOS assigned a seasoned diplomat in Ambassador Stuart Jones who had extensive experience in global hotspots as well as on the National Security Council staff. DOD assigned Brigadier General Gary Cheek, CF–J Commander, who had worked with interagency colleagues in Afghanistan, and led the early U.S. military presence there. For their part, USAID assigned Beth Paige as Jordan Mission Director who came to the assignment with experience in numerous “conflict embassies” as well as at the U.S. Army War College as professor of international development. Likely inspired by a visit to CENTCOM and Special Operations Command that USAID/CMC arranged prior to her onboarding as Jordan Mission Director, Paige invited SOCCENT to participate in the development of the USAID Country Cooperation Strategy (CDCS) for Jordan, an interagency first. This innovation helped pave the way for SOCCENT’s incoming Civil Military Support Element (CMSE) to collaboratively, vice independently, support 3D goals. Further, SOCCENT petitioned for and obtained DOD approval for out-of-cycle Overseas Humanitarian, Disaster, and Civic Assistance Funds to contribute to needs identified by the 3Ds. USAID and DOS representatives participated in DOD’s annual “Eager Lion” exercises with the Jordanians and at least a half dozen scenario-planning exercises which anticipated responses to developing challenges. Together, this joint development of strategy, assessments, and exercises clearly and effectively recognized and applied the lessons of prior operations in a meaningful and efficient manner. In another first, USAID formally requested a civil affairs planner from SOCCENT to join USAID/Amman as an integral member of the staff. The innovation was matched later by the appointment of a Senior Civil-Military Affairs Advisor (SCMA), a USAID Foreign Service officer who had just attended the U.S. Army War College, with responsibilities at both CF–J, and the new Southern Syria Assistance Platform (SSAP). At SSAP, DOD, DOS, and USAID all provided embedded personnel. In 2014, as USCENTCOM was given the train and assist mission for Syrian opposition forces, one of the first actions taken by the new commander was to ask for DOS and USAID senior “embeds.” A key problem however was the lack of available experienced staff at USAID or DOS to fill this type of role. Unfortunately, unlike DOD, because of staff constraints, neither foreign affairs agency has the equivalent of “troops” at home waiting to be deployed or training for the next mission. Complex environments can impose severe demands on normal embassy operations. Embassies struggle to manage the added burden of dealing with massive, dynamic change. Reinforcing structures that are temporary and flexible in nature can help relieve the burden and enhance progress toward resolution or mitigation of the crisis. Such was the case with the creation of the SSAP. The U.S. Embassy in Amman had already formed a working group in the early days of the Syrian conflict with 3D representatives. For its part, USAID had implemented an extraordinary innovation in the creation of the position of deputy mission director for Syria in the Amman Embassy. With the escalating Syrian conflict, the Embassy decided to turn the working group into something more structured and dependent on USAID for administrative purposes. This move was intended to facilitate dismantling of the structure when it was no longer needed. It featured the innovation of co-location, where 3D agencies worked side-by-side. Though similar in concept to the Provincial Reconstruction Teams (PRTs) in Iraq and Afghanistan, the SSAP operated at the headquarters level only without deployed staff in the country of focus; and personnel were more evenly distributed among the 3Ds as opposed to the thin veneer of civilians in the PRTs. The U.S. military can provide intelligence, surveillance, and reconnaissance assets, personnel from across the armed services, planes, helicopters, land vehicles, and many other resources. The sheer amount of personnel and material can rapidly overwhelm the much smaller, less-equipped DOS and USAID staffs. Though much of the discussion above indicates civil-military coordination, the unprecedented level of coordination in Jordan deserves special attention as an innovation. A four-person CMSE team planned and implemented a relatively modest (in dollar terms) array of projects that served as both gap fillers and focused on areas where other agencies were restricted from using appropriated funds.26 The embedded civil affairs planner helped the CMSE team coordinate those activities with both USAID and DOS. The newly created SCMA position filled a need for coordination on small projects to encompass design, authorization, execution, and monitoring. In addition, the SCMA facilitated interaction between USAID and DOD counterparts and coordinated all direct engagement between the CMSE team, the GOJ, and implementing partners. CF–J and later the Combined Interagency Joint Task Force that coordinated counter–ISIL programs hosted the SCMA as a liaison. The interagency interaction was nonetheless not totally free of problems. Rapid rotation of CMSE teams—every six months—combined with concomitant attempts to rehash old issues created pressure to codify rules to govern the relationships. The SMCA wrote a “rules of the road” guide in 2015. Approved by the Ambassador, this guide formalized the relationships between the USAID SMCA, embedded CA planner, the CMSE team leader, and their parent organizations. The rules included the use of assessment to guide planning. DOS/Population, Refugees, and Migration worked the UN and other partner channels; USAID gave technical assistance and often liaised with local officials; and the CMSE team wrote actual project plans. Give the workforce the 3D training and education needed to prepare it for crises and make 3D experience and interagency rotations a professional requirement to ensure leaders have the tools and knowledge to handle crises. This will enable leaders and personnel to leverage other institutions’ critical capabilities at pivotal moments. Again, despite an intensive effort spanning years, the results were not enduring. In between the promise of a National Security University and the National Security Professional Directive effort, the massive deployments of both military and civilians to Iraq and Afghanistan forced the USG’s hand. A frequent series of intensive, multi-day trainings regularly put the “interagency” together to prepare for these missions. Hosts spanned the “interagency”—to include DOD, DOS, USAID, and USIP. The personnel learned the basics about their specific capabilities and what their plans were for work in the intended environment. Other initiatives—too numerous to mention here—were undertaken. The important point here is that they are all gone. No real, regular, robust training is occurring any longer. Agencies have fallen back on the assignment of personnel and faculty to DOD’s NDU and the Service’s War Colleges where a small number of non-DOD personnel mingle and study with their colleagues from other agencies and countries. Those in the business of conducting such complex operations have witnessed the profound impact that the Goldwater Nichols Act created for jointness among the armed services and with other agencies in the national security community. Service men and women are sprinkled throughout the “interagency” performing real staff jobs and gaining critical knowledge and skills through these rotations. Other agencies have “rotations” and representatives: notably, DOS and USAID place foreign policy and development advisors respectively in the Pentagon and subordinate commands. DOD assigns representatives from each of the Combatant Commands and some of the services to USAID where they are housed in the Office of Civilian Military Cooperation. USAID has been “deputizing” personnel in its critical Missions as mission civil-military coordinators to enable coordination. This innovation is modeled after the successful designation of mission disaster resource officers to facilitate cooperation during natural and man-made disasters. During the past tumultuous years with rough environments spanning the globe, these assignments have narrowed the gap in understanding and helped to foster real cooperation. The sticking point of actually rewarding civilian personnel for these assignments—as DOD does—bedevils these efforts and must be addressed for success. Leaders should be encouraged to adapt steady-state planning processes (e.g., USAID’s Country Development Cooperation Strategies, DOS’s Integrated Country Strategies, and DOD’s Country Cooperation Plans) and mechanisms (e.g., embedding military planners in USAID missions) to enable crisis planning that establishes and communicates clear priorities based on shared assessments. The United States does not have adequate processes for crisis planning. Standard department-specific frameworks often force resources and programs into long-term commitments, undermining the ability to align programs with evolving priorities during crises. The sudden and urgent need for organizations—that have not planned together—to then work together, often yields confusion, lack of coordination, lost resources, time, and even costs lives. Congress and the Executive Branch should collaborate to right-size resources, while establishing trust that enables flexible funding and new or adapted authorities during crises. Normal budgetary cycles are too long to account for the volatility of complex crises. Restrictive authorities and earmarks can hamstring implementers and, during crises, the accelerated operational tempo does not always permit drawn-out consultation and guidance to alter those authorities. In complex crisis environments, discretionary funds such as economic support funds, and flexible accounts such as USAID’s Transition Initiatives account empower 3D leaders to respond to new or unforeseen developments. Suspended this year by the Trump Administration, the Counter ISIL Relief and Recovery Fund authorized by the U.S. Congress in 2017 represented an attempt at flexible funding. Carve-outs or exceptions to existing authorities can help ensure Washington does not create artificial barriers to achieving results. However, flexibility does not supplant the need to right-size resources, so that the agency with the appropriate tool for the mission is able to employ it. And more is not always better; too many actors or too many resources can threaten the mission. The United States should stand up new structures or processes as needed to support the mission (including special representatives), with clear guidance regarding when they will phase out. Breaking events often outpace the ability of U.S. structures and processes to adapt to new needs and realities, even when there are experienced leaders, clear priorities, authorities, and funding. Real-time adjustments to staffing, implementation mechanisms, and structures and processes are necessary to meet rapidly evolving crises. Co-location of the 3Ds, purposeful layering of funding streams and authorities to achieve impact, and embedding personnel from one department in another can create efficiencies and help ensure unity of effort. Success requires both empowered field leadership and robust structures in Washington; field versus Washington-based leadership is a false dichotomy. The 3D institutions should bring together teams that normally work via bilateral engagement mechanisms to align activities and budgets so that they can serve transnational priorities. Even the most flexibly resourced, adaptive missions may not be fully prepared to address all crises. Many are driven and exacerbated by non-state factors and regional dynamics; yet U.S. foreign policy remains bilaterally focused and ill equipped to tackle transnational issues. While foreign and security assistance and diplomatic influence are typically delivered bilaterally, effective U.S. responses often require pursuit of regional objectives. Scene from Zaatari refugee camp in Jordan in 2017. 1 The views expressed in this paper are my own and do not represent the U.S. Institute of Peace. The three case studies—all written by Ms. Beth Ellen Cole, Ms. Alexa Courtney, Ms. Erica Kaster, and Mr. Noah Sheinbaum—were published by USIP in in September 2017: “From Pariah to Partner: The US Integrated Reform Mission in Burma, 2009 to 2015,” available at <https://www.usip.org/3dlessons/burma>; “Breaking Boko Haram and Ramping Up Recovery: US Engagement in the Lake Chad Region, 2013 to 2016,” available at <https://www.usip.org/3dlessons/lakechadregion>; and “Preserving Stability amidst Regional Conflagration: US Engagement in Jordan, 2011 to 2016,” available at <https://www.usip.org/3dlessons/jordan>. 2 “Fragility is the absence or breakdown of a social contract between people and their government. Fragile states suffer from deficits of institutional capacity and political legitimacy that increase the risk of instability and violent conflict and sap the state of it resilience to disruptive shocks.” Fragility Study Group, U.S. Leadership and the Challenge of State Fragility (Washington, DC: Center for a New American Security, Carnegie Endowment for international Peace, and United States Institute of Peace, September 2016), 5, available at <https://www.usip.org/sites/default/files/ US-Leadership-and-the-Challenge-of-State-Fragility.pdf>. 3 Mona Alami, “The New Generation of Jordanian Jihadi Fighters,” Sada, Carnegie Endowment for International Peace, February 18, 2014, available at <http://carnegieendowment.org/sada/?fa=54553>. 4 David Bishop, “Legitimizing Crackdown on Dissent in Jordan,” Sada, Carnegie Endowment for International Peace, July 20, 2014, available at <http://carnegieendowment.org/sadafa=56223>. 5 Alami, “The New Generation.” Jordan’s per capita income reportedly grew from $10,229 in 2010 to $10,880 in 2015, although a UN document outs the per capita gross domestic product at $5,749 in 2013. The USAID 2013 to 2017 Country Development Cooperation Strategy cites positive opportunities for development in Jordan that include a young workforce, a forward-leaning reform-minded government, and improving health and education indicators. 6 “Jordan: Country Development Cooperation Strategy 2013-2017,” USAID, amended March 2015, 13, available at <www.usaid.gov/sites/default/files/documents/1883/Amended-Jordan-Country-Development-Strategy-March -2015.pdf>. 7 “CIA Factbook: Jordan.” “Jordan: Water is Life,” the Health and Environmental Linkages Initiative (HELI), World Health Organization, available at <www.who.int/heli/pilots/jordan/en/>. 8 Donna Abu-Nasr, “Unwanted: The $10 Billion Gas Deal With Israel that Jordan Needs,” Bloomberg, October 26, 2016, available at <www.bloomberg.com/news/articles/2016-10-26/unwanted-the-10-billion-gas-deal-with-israel-that-jordan-needs>. 9 “Jordan’s First Nuclear Reactor to Start Operations by 2025,” Jordan Times, March 19, 2016, available at <www.jordantimes.com/news/local/jordan’s -first-nuclear-reactor-start-operations-2025’>. 10 “Syria Regional Refugee Response,” UN Human Rights Commission, available at <http://data.unhcr.org/syrianrefugees/country.php?id=107>. 11 “Jordan: Country Development Cooperation Strategy 2013-2017,” USAID, amended March 2015, 13, available at <www.usaid.gov/sites/default/files/documents/1883/Amended-Jordan-Country-Development-Strategy-March -2015.pdf>. 12 “Syria Regional Refugee Response,” UNHCR, available at <http://data.unhcr.org/syrianrefugees/country.php?id=107>. 13 Statement made by a Jordanian member of Parliament, quoted in Maha Yahya, “Refugees and the Making of an Arab Regional Disorder,” Carnegie Middle East Center, November 9, 2015, 40, available at <http://carnegie-mec.org/2015/11/09/refugees-and-making-of-arab-regional-disorder-pub-61901>. 14 “Population Statistics,” UNHCR, available at <http://popstats.unhcr/en/time_series>. 15 “Preserving Stability amidst Regional Conflagration: US Engagement in Jordan, 2011 to 2016,” 3, available at <https://www.usip.org/3dlessons/jordan>. 16 Jeremy M. Sharp, “Jordan: Background and US Relations,” Congressional Research Service, January 27, 2014, 14, available at <www.refworld.org/pdfid/5301e9e64.pdf>. 17 Dollar amounts are from “US Foreign Aid by Country (Jordan 2015), “USAID, https://explorer.usaid.gov/cd/JOR?implementing_agency_id=1; conditions are from USAID, “Jordan: Country Cooperation Development Strategy 2013-2107,” 13. 18 “Syria Humanitarian Assistance Response Plan (SHARP) 2012,” Financial Tracking Service, available at <https://fts.unocha.org/appeals/396/flows?order=simple_property_1&sort=asc&f=sourceOrganizationIdName%3A%22933%3AUnited20%States%20of%20America%2C%20Government%20of%22>. 19 Suleiman Al-Khalidi, “In Jordan, a Syrian Camp Withers,” Reuters, November 22, 2016, available at <www.reuters.com/article/us-mideast-crisis-syria-jordan-camp-idUSKBN13H1D1>. 20 U.S. Department of State, “Operation Inherent Resolve: Quarterly Report and Biannual Report to the United States Congress,” Lead Inspector General for Overseas Contingency Operations, December 17, 2014, to March 31, 2015, available at <https://oig.state.gov/system/files/oir_042915_-_a2.pdf>. 21 “The Jordan Compact: A New Holistic Approach between the Hashemite Kingdom of Jordan and the International Community to deal with the Syrian Refugee Crisis,” Government of Jordan, February 7, 2016, available at <http://reliefweb.int/report/jordan/jordan-compact-new-holistic-approach-between-hashemite-kingdomjordan-and>. 22 “US Central Command (Forward)-Jordan (CF-J),” GlobalSecurity, available at <www.globalsecurity.org/military/agency/dod/cf-j.htm>. 25 USAID, “United States and Jordan Sign Third Loan Guarantee Agreement,” press release, May 31, 2015, available at <www.usaid.gov/news-information/press-releases/may-31-2015-united-states-and-jordan-sign-third-loanguarantee-agreement>. 26 “For example, civilian organizations of the US government sometimes cannot procure items quickly enough or do not allow construction. Some programs are limited by statues forbidding the provision of foreign assistance to armed actors (e.g. border guard military officials who needed office equipment; camps supporting ISIS defectors),” Preserving Stability amidst Regional Conflagration: US Engagement in Jordan, 2011 to 2016, https://www.usip.org/3dlessons/jordan. 28 Testimony of Nancy Kichak, Office of Personnel Management, April 30, 2009 available at <https://www.opm.gov/news/testimony/111tPrh-congress/national-security-professional-development/>. 30 USAID Policy on Cooperation with the Department of Defense, June 2015, available at <https://www.usaid.gov/sites/default/files/documents/1866/USAIDPolicyCooperationDoD.pdf>. >. Licensed under Creative Commons Attribution 2.0 Generic License. Photo unaltered.